How do you tell someone what they’re selling isn’t worth what they’re charging for it? This is a dilemma I’ve been left with after reviewing this vehicle. 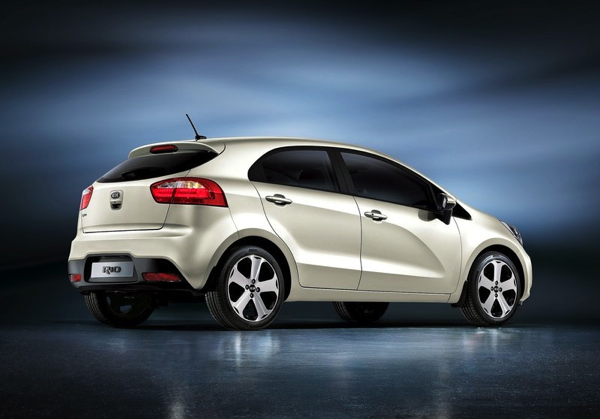 The 2012 Kia Rio is Kia’s entry-level vehicle – size- and price-wise. At the starting price, it has little competition – you can get into one for CDN $14,095. The one I reviewed was the second from the top – the EX Uvo Auto is priced at $18,795 and includes everything I will talk about here. Which is quite a bit. Let’s see what’s under that short, slanted hood. It’s nothing pretty – it’s a combination of ugly and shrouding that covers up more ugly. 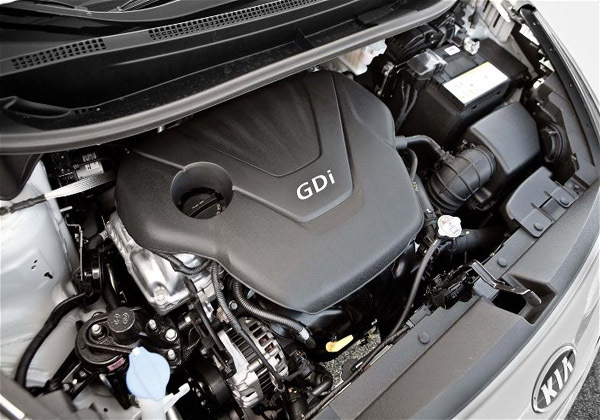 It’s Kia’s 1.6 Litre DOHC, direct injection 4-cylinder engine with dual-cam variable valve timing (CVVT). It’s nothing ground-breaking, but it is a thoroughly modern power plant, and churns out appropriate power for this class and engine-size. It’s rated at 138 HP @ 6300 rpm and 123 lb.-ft. @ 4850 rpm. Not bad, not great. It’s not an engine that will stir your soul, but it certainly will move you off the spot just fine, and typically you don’t expect much more than that, performance-wise, at this price level. I was quite happy with this engine. Mileage is fantastic, in terms of the ratings. Kia has it rated at 6.8 L/100 km (35 mpg) in the city and 4.9 L/100 km (an astounding 48 mpg) on the highway. I saw 7.2 L/100 km (33 mpg) over the time I drove it, which isn’t bad, considering I never drove it with a light foot. That comes out of almost exclusively city driving, with a couple of quick squirts down the freeway. Styling-wise, the new Rio is just a complete 180-degree turn from where the last generation Rio left consumers. I won’t get into the last generation one, but it wasn’t pretty. 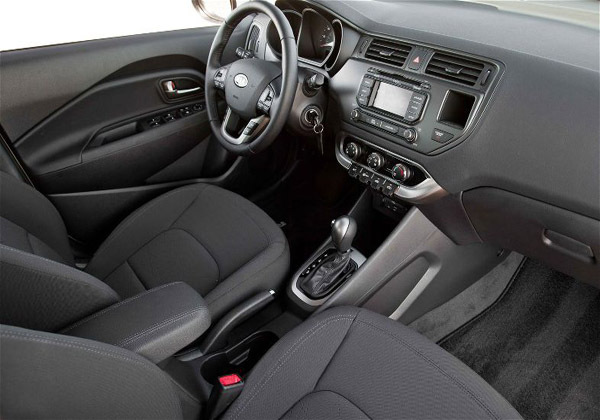 The 2012 Rio enjoys a very clean design. The ex-Audi design chief, Peter Schreyer, has given it nice smooth sculpted lines, with a lovely chiseled scallop on the side – it adds a lot of character. 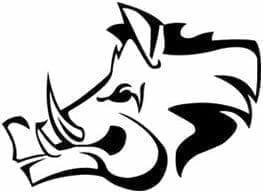 You’ll also see the familiar corporate snout in the grille. I found the front end looks aggressive, in a good way, and includes foglights, and the rear end is clean and well-designed. I liked the wheels – they look sporty and, at this price point, fancy! The car is small in terms of its outside dimensions – pictures don’t quite do its small size justice. Get into the easily accessible driver’s seat, and you’ll see a clean, well-designed dash. Materials-wise, the Rio has a ways to go. I felt that there is an abundance of hard plastics, and I heartily disagree with the literature that indicates this car has a “soft-touch dash”. It’s not. The only soft-touch materials are a slight pad in the door panel. With that said, the plastics have a nice visual texture to them, but the competition has headed down the soft plastics road – time to catch up! Other than that, I really liked the interior. The seats are firm, and decently bolstered. I thought they were initially uncomfortable, and once manually adjusted and properly positioned, they were just fine for me. I thought the seat fabric, at least the inserts in the center panels, was terrible – it looks like a bunch of random stitches. Not for me, thanks. I really liked the little steering wheel – it felt good in every situation. It’s manually adjustable for height and reach. Speaking of tactile goodness, I really liked the feel of the shift lever. It’s perfectly shaped, and I tend to rest my hand on the lever, even in an automatic. It’s great for that, and feels just right when you’re manually shifting that lever up and down. The headroom in the front is reasonable, but not great. In front of you, you’ll find a clean 3-gauge instrument cluster – one large full gauge speedometer in the middle, flanked by two half-gauges – the tach on the left and the fuel gauge on the right. Below the the speedometer is a driver information screen. The center stack starts with vents on the top. Below that is the media control and screen area, and below that the climate control which is manually adjusted. At the bottom of the stack, you’ll find a recessed bin. 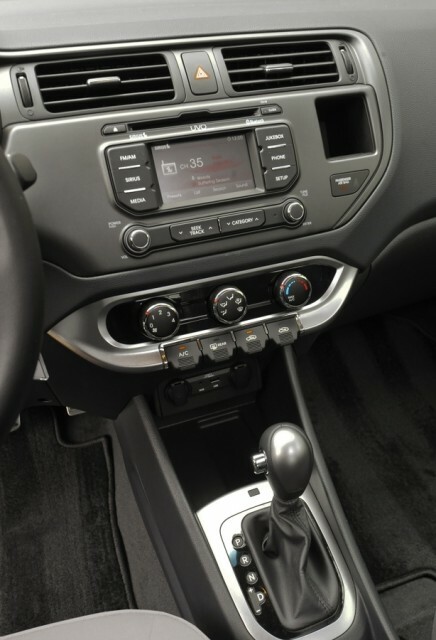 The center console starts with that recessed bin, the automatic shift lever and a traditional parking brake lever. There is a fuel-door release on the floor near the driver’s door. Now, looking at this car for the first time, and absorbing its price, you’d think this section would be short and sweet. You’d be wrong. I was duly impressed by the amount of goodies packaged with this car – at this price. Overhead, you’ll find a nice tilt/slide sunroof, and LIT vanity mirrors – that made my wife happy! 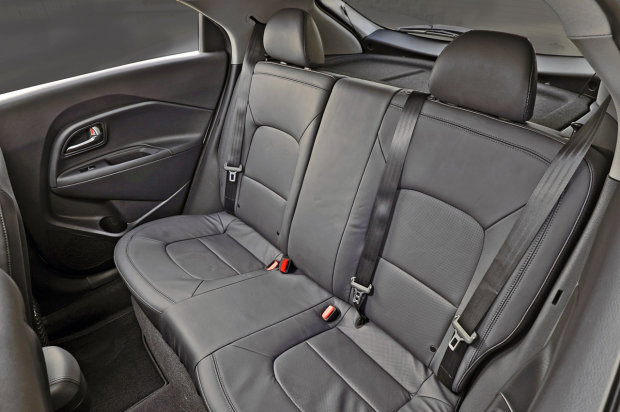 The front seats are heated – the heating elements work well and quickly. The steering wheel has a bunch of controls on it – for your phone, voice recognition, media and cruise control. Headlights are automatically controlled, which is quite unusual in this class. Power door locks, windows and mirrors are all controlled from the driver’s door panel. Interestingly, especially at this price level and on a vehicle this small, the mirrors are also power-folding. A lovely bonus! The Rio is started with a traditional key, but comes with a remote door lock FOB. The driver information screen is excellent, and other manufacturers could take some lessons away from it, in terms of what can be done with a small screen and what should be available to the driver. The screen clearly displays what gear you’re in and the odometer. You can switch between additional information, including average and instant mileage, average speed, elapsed time, outside temperature, fuel range and 2 trip meters. I can’t imagine needing more than that, and that’s better than I’ve seen on vehicles costing significantly more. In this configuration, it uses a small touch-screen and a series of well thought out hard buttons. The layout is simple, and navigating the system was easy and straight-forward. The screen is quite small, but crisp and the graphics are excellent. I thought the screen was occasionally less than perfect in terms of responsiveness, and required the occasional double-tap – but overall, using it was a great experience. The sound system, integrated into the Uvo unit, has 6 speakers and doesn’t sound great. But it works very well. 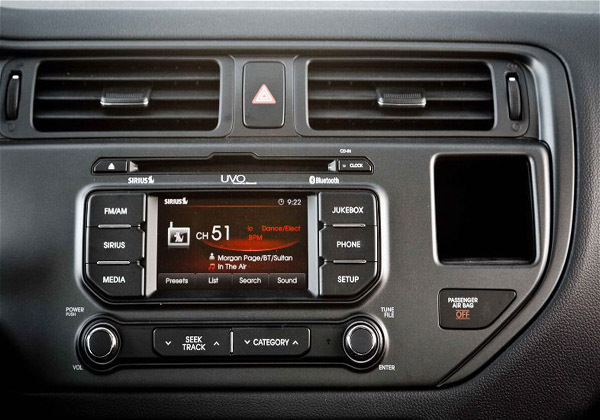 Sources are awesome – including AM, FM, Sirius satellite, a hard-drive based jukebox for ripping your own tunes, CD, auxiliary plug, USB sources and Bluetooth streaming. I can’t really think of anything more you’d want. And they all work well. You’ll find the auxiliary and USB plugs in front of the recessed bin where the center stack meets the center console, in addition to two 12V plugs. Well placed and thought out. Phone integration is great, and pairing a phone is simple. Here’s the kicker – even though it’s coupled with a small screen, this car has a back-up camera with distance markings on the screen. There are cars at double the price that don’t have a camera. See my review of the 2011 BMW 328i if you’d like some proof. In terms of driving tech, you’ll find an “Active ECO” mode button – I’ll talk about that in the driving section. See what I mean? This car is actually pretty loaded up with tech and goodies. Considering this is a small car, it does quite well with storage options. The cargo space is surprisingly large and useful. You’ll find a mesh storage pocket back there too. To increase it significantly, the rear seats fold down (albeit not flat) in a 60/40 split. You also get some tie-down loops back there (not heavy-duty, but certainly enough to keep luggage, etc. in place) and the space is topped off with a hard tonneau cover, which swings up with the rear hatch. Those covers have pros and cons – they’re excellent for security, but can be in the way when you’re trying to maximize your cargo area and can be a pain to remove and store. That said, it also adds additional space in the back to put coats and other stuff for road trips. In front, you get a huge glove compartment. Where the center stack meets the center console, you’ll find a recessed open bin – it’s big, and smartly placed and quite useful. There are two inline cupholders in the console, and behind that, an armrest with a sliding lid to adjust for comfort. Lift the lid and you’ll find a deep bin with a relatively small footprint – which isn’t that great, but better than nothing. The door pockets include another cupholder and an oddly-shaped bin – they’re useful. Finally, in the middle of the dash, there is a 2″ square hole – about 3-1/2″ deep. It has a rubberized bottom, to keep things from sliding out of it, but I can’t imagine what you’d put in it. Maybe an old-school cell phone? Smartphones don’t fit in it, width-wise – they have to be put in at an angle, which defeats the purpose. It’s a strange little cubbyhole. Getting into the back seats is pretty easy for a small car. I found the legroom to be OK – it would be barely passable in a bigger car, but this is as compact as it gets for a 4-door, so it will do. Kids would be alright, but adults won’t be happy there for long. Footroom, on the other hand, was fine – there is quite a bit of space underneath the front seats. You will find 3 seats, with 3 seatbelts. As is typical for cars this size, calling the middle space a seat is a bit rich, unless it’s for a small, well-behaved dog. Kia put 2 head-rests back there, showing us that they know the middle seat isn’t fit for human consumption. Family friendliness is fine – accessing the back is easy thanks to the back doors – child seats and boosters fit well. You’ll find two sets of LATCH anchors. In terms of storage, there ain’t much. Door pockets are actually just cupholders, but they do function well, and you have two map pockets on the front seatbacks. As expected, this isn’t a fast car. But it does have enough power to get you where you want to go. It’s perfectly fine for everyday driving, and even on the freeway, it didn’t feel like it was running out of breath. Don’t expect any neck-snapping acceleration – in any gear. It’s not that kind of car. I did enjoy the little snarl that the 4-cylinder came up with – it made it fun to step on it, whether it really sped up things or not. The 6-speed transmission left me highly impressed. I thought it did a fantastic job in every circumstance, and that’s more than I can say for most automatic transmissions I’ve used. Simply commuting from point A to point B, I found the transmission smooth. But change your driving style, and I felt that the transmission never felt lost – it always knew what I wanted from it, and I felt it always made the most of the power it has to work with. For example, when I’d drive a little more aggressively, the transmission wasn’t afraid to hang onto a gear a little longer here and there, as if it had read my mind. Frankly, I thought it did a better job at adapting to a more aggressive driving style than some transmissions with “Sport” modes. Nice work, Kia! All things considered (how light this car is, and how short the wheelbase is), the ride was pretty good. I’d say it’s firm, but not to the point of being harsh. It remains on the comfortable side of firm rides. I’m guessing it would settle down a bit more if you got a couple more adults in the car, but it would likely slow things down too. Although the car does have noticeable body roll, it’s not disconcerting and to be honest, it does nothing to harm the car’s ability in the corners – you can feel free to throw the Rio into corners with aplomb, and it won’t complain – it just ends up where you pointed it. The brakes felt good – not great, but not mushy, and they always provided appropriate braking power. I had a few, but at this price level, with this much to offer, it seems silly to be nitpicking. Yet here we are – must be my German blood. One thing I took issue with is that Kia chose to make the front seat-backs a hard plastic material, rather than upholstering them. This is a major oversight, because the legroom real estate is already at a premium back there – if you have longer legs, and they’re pressed up against the front seats, you’ll be extremely uncomfortable, because they’ll be bunched up against hard, unforgiving plastic. Not a great place for your knees on a road trip. I thought Kia could have done a better job with the sound insulation. The road noise was quite high, and driving over the gravel-strewn winter streets in Edmonton, I found you could always hear the rocks and the road grit chattering into all the wheel wells. I never spent any time with the previous generation Rio, and I did read that this is a major improvement in terms of sound-deadening, but I think it could be quite a bit better. It’s no tin box, to be sure, but it gets irritating after a while. Oh right, I said I’d talk about the “Active ECO” mode. So, I couldn’t find much information about it, but when the button is depressed, the entire car becomes depressed. As noted, it’s not a fast car, but it’s definitely sufficiently nimble to be enjoyable. Not so in the ECO mode. I’m guessing it retards engine and throttle response to maximize fuel economy, but whatever they do, it makes the car become a complete slug. I’d say the mileage in regular driving mode will be enough to make most people happy, and the compromises the ECO mode bring will be enough to get most people to stay away from it. Unless you’re just in bumper-to-bumper traffic anyway, I’d say forget about the ECO thing. Outward vision is good, with the exception of doing shoulder checks. The rear pillars are very chunky, and they do create a blind spot that has to be reckoned with. I wouldn’t call this car “fun” to drive, but for this class of vehicle, it’s as close as you can get – I couldn’t ask for much more at this price. Couple of things that caught my attention – I liked the little row of cool orange LED lights on the front of the side-view mirrors used as signal repeaters. I really enjoyed the feel of the shift lever – it felt perfect for me. The bin at the front of the center console has an indentation in it – which is perfectly-sized for smart phones. It will keep most any smart phone in place, without having it slide around. Why doesn’t EVERYone make stuff work like this? The steering wheel has a mute button on it for the media system. Brilliant! This is a lot of car for the money, and paired with an amazing warranty, I wouldn’t hesitate to recommend it. In this class, at that price, I give the Rio an 8 out of 10. WAF (Wife Acceptance Factor) was middling. She was quite taken with the illuminated vanity mirrors (I know this sounds horrible, but I can’t make this stuff up!) and thought it looked cute, but felt the car was too small for her. This coming from a woman with 3 kids and a shopping addiction, which we all know makes her a poor opinion source for small cars anyway. – LED positioning lights – don’t ask me what those are, I have no idea – daytime running lights, maybe? EDIT: Thanks to schooled reader, Joel Cummings, I now know these are in the tail-lights. I’m not sure how positioning lights and tail lights differ, but there you have it! – Supervision instrument cluster – once again, I’m at a loss – sounds lovely though, right? Obviously, I was being a bit misleading at the beginning, implying that perhaps they’re charging too much for the Rio. Frankly, I’m considering calling Kia and telling them it’s worth more than what they’re selling them for. How can they not see this? I don’t know of any competition that packs even close to as much into a car at this price. Hey, whatever – to slightly misquote a Monopoly Community Chest card, “KIA Bank Error In Your Favor” – take it and run! I felt this car was put together well. I noticed no squeaks or rattles while driving it, and I have to say that short of a few nitpicks, I was left highly impressed by this car. Good job, Kia. Put some soft-touch materials in there, work on the sound insulation, and you’re looking at a 9 out of 10 in this class. Disclosure: Vehicle was provided by KIA.